Christmas is nearly here! My little miss has enjoyed some Christmasy sensory play this week. For something different (and just because it was in my pantry) I dyed some risoni pasta with red and green food colouring (hand sanitiser and few drops of pine essential oil was the best method I found - sets the colour and smells like Christmas). I raided my left over Christmas decorations, craft box and bits and pieces we had around the place and made her this sensory bin. Big success! I thought a Christmas discovery bottle would be lots of fun for my little nephew (8 months old). I popped some of the red/green risoni pasta in with some jingle bells, red/green pom poms, red glitter and scrunched up cellophane. I hope he'll like it! 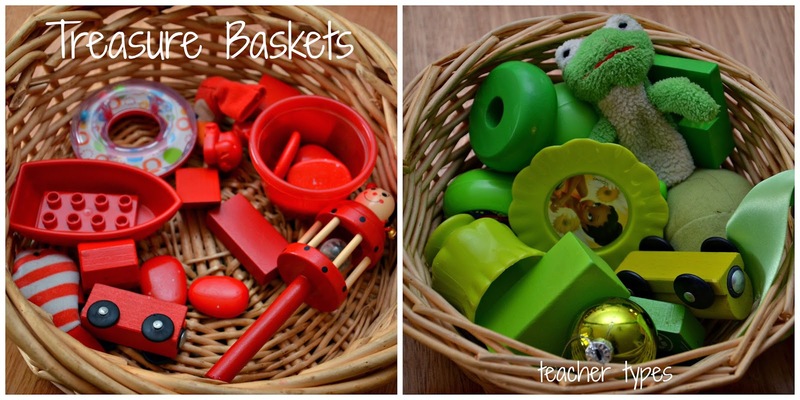 Last year (before I had my blog), I put together these treasure baskets - one red and one green. Thought I would give it another go, just with bits and pieces from Miss M's toy boxes. 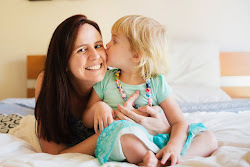 As I've mentioned previously on the blog, sometimes the same old toys presented in a different way can seem new, interesting and visually appealing to babies and toddlers. Older children could find the items themselves - set them the challenge! Count how many objects you found or make a pattern - red/green/red/green. My last batch of playdough was getting a bit old and tired, so I thought it would be a perfect time to make some more. I made it with the traditional red/green Christmas colours in mind, but thought white would be fun as well. When you provide your little one with colourful decorations - they really stand out against stark white playdough. Some cookie cutters in Christmas shapes and loose parts completed this play experience for little miss. If you're still thinking of a gift to give a little person, whether it be your own, a niece or nephew, or a friends child - consider giving the gift of sensory play (sometimes called 'sensory kits' if given as a gift). Children have so many toys already - why not give something handmade and a bit different? 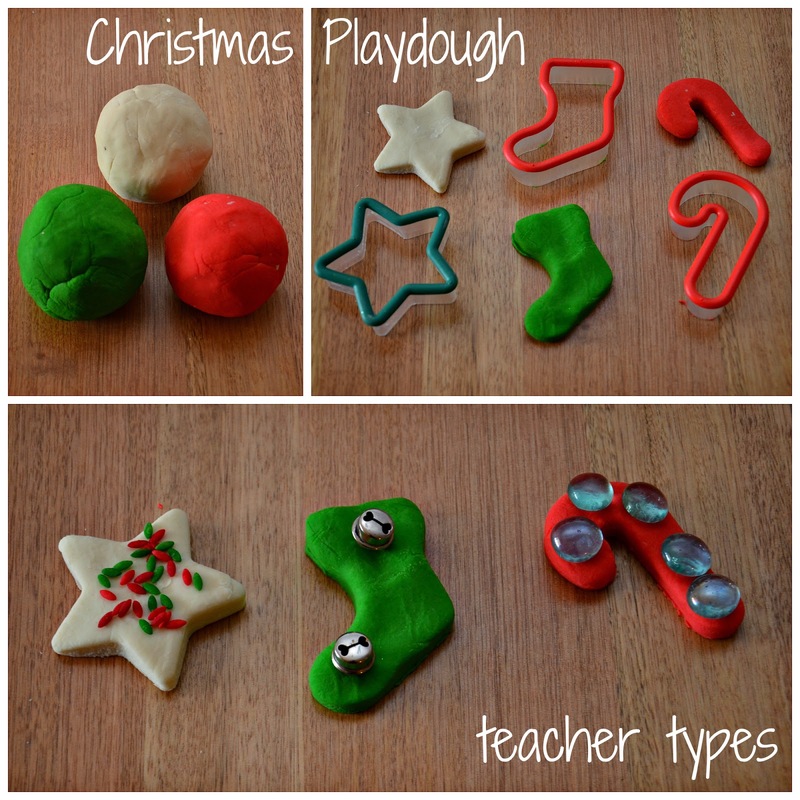 I 've never thought of Christmas themed play dough before, but what a great idea! It looks so pretty! Hi Mrs D! I tried several different ways to dye the pasta/rice - vinegar was too smelly, and just plain food colouring in a zip lock back stained our hands when we played with it. So I would definitely recommend giving the hand sanitiser a go!